Jews sans frontieres: Why write about Jews? Beware – a publicity blurb about a book follows. The book is mine – Jewish Identity and Palestinian Rights – and it analyses diaspora Jewish opposition to Israel. There'll be a description of what the book is about over at Mondoweiss. There’s another description from Zed, with blurbs from Omar Barghouti and Ilan Pappe, and you can buy it over at Amazon as well. But here at JSF we like to go deeper, and so I want to talk about what I was trying to do with this book. Firstly, I was trying to research something positive. Whether in academia or activism there’s a focus on the negative, on the problems. This is necessary, but we also need to move beyond the ‘ruthless criticism of everything existing'. The piling up of critiques often leads to despair, when the point after all is to change the world. There’s no doubt how energising researching those of us trying to change the world was. It was a real joy, a privilege to chat to activists around the globe, asking whatever questions I felt like about their work. Listening to what these activists were doing and why was fantastic, a genuine education. I also wanted to critique this movement. In fact, starting off, I was far more critical, suspicious that the movement was as much about ‘healing the Jews’ and fighting Jewish identity wars, than about Palestinians. My increasingly positive take on the movement was partly a result of ‘going native’, of growing respect for movement participants, but also because of a growing understanding of the actual work the movement does to promote justice in Israel/Palestine, something which takes up far far more time than any discussions of Jewishness. This positivity (mixed with criticism) was also because of my own deepening involvement with Palestinian solidarity work. While it’s important to critique tendencies that lead to Jewish groups treating Palestinians as unfortunate helpless objects of solidarity, I could see similar dynamics at work within wider solidarity. So I began to see this tendency as a function of distant issue activism, and analyse how it comes about and how it can be dealt with. This leads to the other reason I wrote this book – I want people to be aware of this movement. Not coincidentally, this is also one of the movement’s aims – to achieve recognition that many Jews oppose Israel, so people stop conflating Jews and Israel. 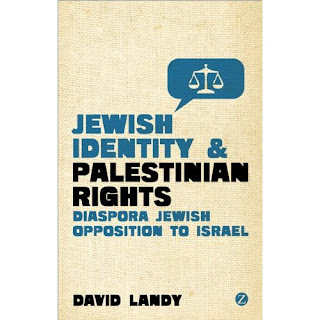 Without losing the run of ourselves, the growth of diaspora Jewish opposition has been a significant development in Palestinian solidarity and it is useful to understand it. So a lot of the book is empirical, concentrating on British Jewish groups, but also tracing the development of this movement in Europe and North America. It’s also beneficial for participants to understand the various facets of the movement. So I took a lot of pleasure in discussing the various stances movement members take on boycotting Israel. Although I take a pro-boycott position, it is helpful to delineate the good, logical reasons why movement members take different positions on the tactic, depending on what field of practice they are contending within. And here’s the last reason I wrote – possibly the most quixotic. It was to make academic theory more movement relevant. The book is definitely an academic work, especially chapter one with its discussions of Pierre Bourdieu’s theory of practice, and social movement theorising of identity. I wanted to deploy this theory in order to say something of use to movement participants, rather than engage in yet another abstract academic discussion which would treat this movement as an inanimate object, a means to produce lofty empty theories. In the end, I wanted to produce a useful document for people in and linked to this movement. It’s not the summation of a monologue about this movement, but the continuation of a conversation that I’ve been glad to be part of.